We bring Paso Robles to you! 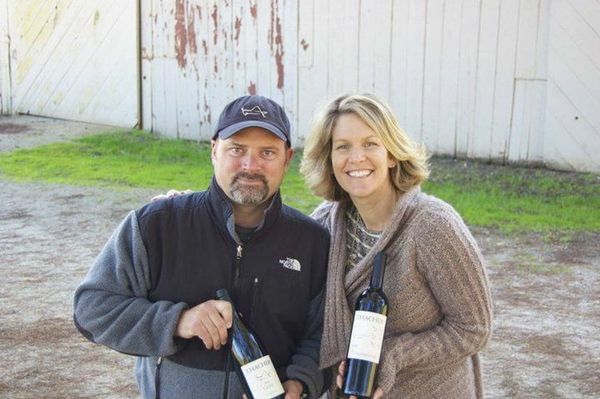 Enjoy the hand-crafted, dry-farmed, Rhone blends and Zinfandels from award-winning Thacher Winery from the westside of Paso Robles with Sherman and Michelle Thacher. Not only are their wines terrific, but they are a wonderful, engaging couple that radiate the hospitality that makes their winery a must-visit in Paso. We will have the back patio of Blush to ourselves--tented, heated, with the outdoor fireplace lit. Blush will be providing tasty appetizers to pair with our Thacher wine selections. · 2011 CONTROLLED CHAOS, Paso Robles (usual retail $42) 47% Mourvedre, 33% Zinfandel, 20% Grenache—each part is equally represented without anyone of them outdoing the other. This wine is delicious and approachable, a true crowd pleaser. · 2011 ZINFANDEL, Paso Robles (usual retail $36) Five different Westside Paso Robles' vineyards make up this blend, one of them being our own Kentucky Ranch Vineyard. This wine is ruby in color with notes of cherry, coffee, cinnamon, and molasses on the nose. The front of the palette has hints of vanilla that give way to a flavor of ripe strawberries. Becomes spicier with air and finishes with silky tannins, strong persistence and a bright jolt of cracked pepper. · 2011 ViN ROUGE, Paso Robles (usual retail $38) A favorite blend of 74% Syrah and 26% Grenache -- very balanced and approachable. This is the perfect cocktail hour wine. Not over-powering or loaded with astringency. Medium bodied, fruity and a crowd pleaser. No fork needed. "For decades quarter horses, cattle and cowboys roamed the grassy hills of the historic Kentucky Ranch. Today we are full of casual charm, reminiscent of California past and present. Since 2004 Thacher Winery with the grasshopper label, has been hand crafting wines from superb dry farmed and head trained vineyards found on the Westside of Paso Robles and in Southern Monterey County. Our boutique production of Rhone blends and zinfandels demonstrate local subtleties and true westside terroir. The award winning winery and tasting room are situated next to a 90 year old barn with spectacular and ever changing vistas of vineyards, hay fields and oak trees. Thacher Winery and vineyards celebrate everything we love about Paso Robles and are sure you will too."